All-Delco Team O'Hara's Vince Gravelle, Mike Callanan, Greg Thomas, Danielle Schopf and Mary Debevec, Ed Dutch, Dave Hollinger and Julia Somers of Haverford, Archbishop Prendergast's Nicole O'Dea, Lauren Hart of Ridley and Kelly Cline and Chris Kessler of Sun Valley. David Marshall, THS Boys XC Coach is looking forward to a good season this year. A large group of seniors are returning, including three varsity runners from last year and a number who sometimes ran in the top seven. After some hard work over the summer, last year's number one runner Ben Marsden (All conference; 23rd at NCC Meet; 14th at Div. 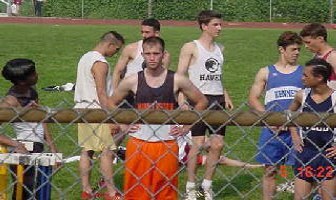 2 State Meet in 2002) will be formidable. Seniors John Mongan, and Roger Rengert, who also ran varsity last year, should have an impact. As always, however, the team's success relies upon the continued development of last year's JV runners and the contributions of some talented newcomers, especially Ian Lonsdale, who looks like he has some talent. Opposition outlook? Tatnall and its number one runner, Kyle Kershner are the team to beat in the Delaware Independent Conference. I expect Tatnall to contend for a Div. 2 state title this year as well, but Archmere is getting everyone back, and they dominated the state last year. The wild card, in my mind, is Red Lion Christian. If they improve the way they have over the last couple of years, they will also contend for the title. They run aggressively and have no fear of anyone in Div. 2. February 17, 2002 By JOHN LOHN jlohn@delcotimes.com WEST CHESTER -- Five months ago, Cody Clauser made a decision. It was time for the Penncrest junior to heighten his dedication to the pool and accept the sacrifices that would accompany the move. What a choice Clauser made. Benefiting from increased and intensified practice sessions, Clauser exited the District One Class AAA Boys Swimming Championships yesterday with an extended season. Posting the county's top time in the 100 butterfly -- a sizzling 52.86 -- Clauser collected a silver medal in his prime event, and in the process, established himself as a medal contender at the state championship meet at Penn State in three weeks. For an encore, he also grabbed a trip to states in the 500 free with a fifth-place finish. 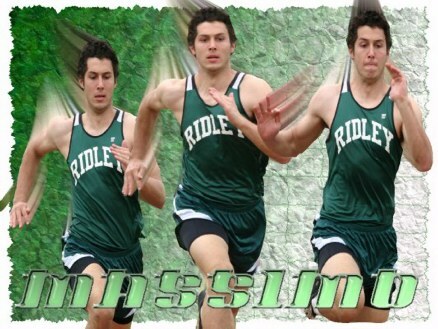 From the start of the fly, there was little question whether Clauser would advance to states. In control for the entire race, Clauser powered to the wall with a strong closing leg, finishing behind only Wissahickon's Pete Reeves (51.96). "I was pumped for the race," Clauser said. "I saw the times from the races before mine and knew there were some guys who went faster than my entry time. I knew I had to motor it. "When I hit the water, I felt great. I got through the first 50 and then went hard the rest of the way. I'm really pleased with how everything has worked out. "Credit Clauser's increased dedication to the water.The Central League champion in the fly, Clauser just missed bids to states last season in the fly and 500 free. In part, those narrow misses urged Clauser to alter his training ways. Working with Suburban Swim Center in addition to his training with Penncrest, Clauser has not only turned to a handful of double-workouts, but has also picked up his intensity level in the water. The result: Many positives, and a few acceptable negatives. "In the fall, I decided it was time to really kick it up," Clauser said. "There were some sacrifices to make, but I wasn't going to let this season slip by. A lot of the sacrifices have been social ones, but it's all been worth it." Clauser's state qualifications marked the second time a member of his family has earned a trip to Penn State. A few years back, Clauser's All-Delco sister, Emma, advanced to states in the fly. "I guess I'm continuing the family tradition," Clauser said. "I have nothing hanging over my head now that I've qualified. I'm going to get back to work and try to drop some more time. We'll see what happens. "Dan Cucchi finally got his wish, albeit in tight fashion.The Haverford High senior, a state qualifier in relay events the past two seasons and as an alternate during his freshman campaign, secured an individual invitation to State College in the 100 freestyle. Springfield defeated Interboro in a non-league meet, 27-30, behind Bob Spence's runner-up finish. Spence was one second off the winning time. Teammate Lew Vastardis ran third. 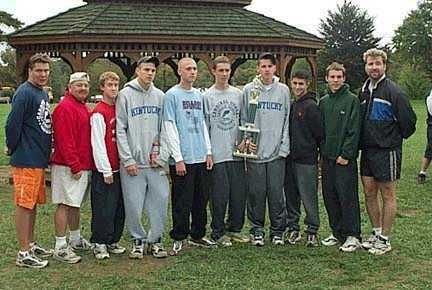 The thirty-ninth annual Delaware County Cross Country Championships were held on Saturday, October 12, 2002, at Rose Tree Park, Media. Six hundred thirty runners from twenty-three Delaware County high schools registered for the event sponsored by the Delco Road Runners Club. Four hundred and sixty-three finished the 3.1 mile course on a overcast day. A light rain fell during some of the events. In the boys' varsity race, Cardinal O'Hara won the team title for the second straight year, scoring 32 points. This team score was due to the fact that O'Hara placed 1st,2nd,5th,6th,18th,19th, and 37th, respectively. Monsignor Bonner finished in second place in the team scoring, they managed to put together 75 points, by going 8th,10th,13th,20th,49th, and 71st. Penncrest took third place. All in all, it was a great day for Cross Country racing in this county. Special thanks to all the teams that participated and to all the athletes and their coaches that made it happen. Indoor Track and Field PTFCA State Championships At Penn State University: BOYS' EVENTS Team scoring: Glen Mills 65, North Penn 43, Abington 36. 60 meters: 1, Tyrone Diggs, Harrisburg, 6.91. 2, Akeem Vance, Greensburg-Salem, 6.94. 3, James Jefferson, Dougherty, 6.98. 60 hurdles: 1, Jeff Kiss, Windber, 8.09. 2, Steve Nichols, Penncrest, 8.10. 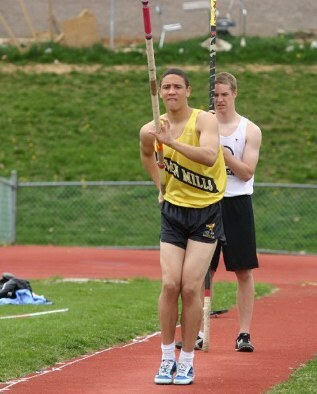 3, Eric Alexander, Glen Mills, 8.12. 200: 1, Barry Jones, Glen Mills, 21.87. 2, Lester Caesar, Abington, 22.04. 3, Matt Henderson, North Penn, 22.30. 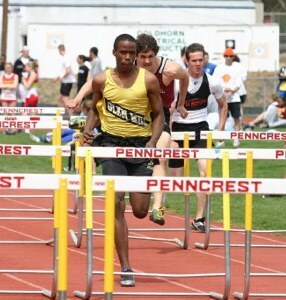 400: 1, Barry Jones, Glen Mills, 48.01. 2, Lester Caesar, Abington, 48.50. 3, Troy Roberson, William Tennent, 49.23. 800: 1, Steve Craig, North Penn, 1:54.91. 2, Dan Michael, North Penn, 1:56.61. 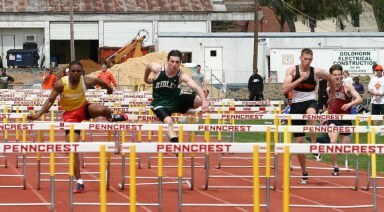 3, Mike Brown, Penn Wood, 1:57.15. Mile: Dan Mazzocco, Baldwin, 4:22.66. 2, Mike Didio, Council Rock, 4:23.71. 3, Joe Francisco, Cardinal O'Hara, 4:26.34. 3,000: 1, Ryan Blood, East Pennsboro, 8:39.78. 2, Rob Robertson, Council Rock, 8:40.98. 3, Dan Mazzocco, Baldwin, 8:41.22. High jump: 1, Tyler Fedeli, Altoona, 6-10. 2, Ray Bobrownicki, Westtown, 6-8. 3, Carson Pickens, Germantown Friends, 6-8. 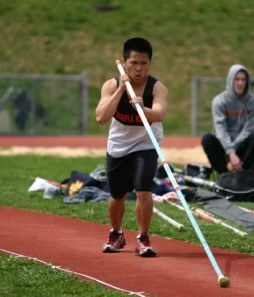 Long jump: 1, Al Gregory, Pennsbury, 23-0. 2, Ryan Westman, Lower Merion, 22-33/4. 3, Jamal James, Central Dauphin, 22-23/4. Triple jump: 1, Mike Whitehead, Norristown, 46-53/4. 2, Galen Rivers, Great Valley, 46-3. 3, Blake Taylor, Methacton, 45-21/2. Shot put: 1, Steve Myers, Conestoga, 60-0. 2, Dane Miller, Schuylkill Valley, 59-11/2. 3, Omain Gullette, Glen Mills, 57-2. Pole vault: 1, Andrew Rademacher, Hickory, 14-6. 2, Paul Hecht, Baldwin, 14-0. 3, Kurt Dunn, Towanda, 14-0. 4x200 relay: 1, Glen Mills, 1:28.49. 2, Abington, 1:30.99. 3, Simon Gratz, 1:31.56. 4x400 relay: 1, Glen Mills, 3:18.73. 2, Abington, 3:20.83. 3, North Penn, 3:23.51. 4x800 relay: 1, North Penn, 7:52.02. 2, Strath Haven, 7:57.35. 3, Mt. Lebanon, 7:59.58.